AD Blake's historical marine oil paintings range from gaff-rigged classic yachts, square-sailed sailing ships to historical America's Cup races and contemporary sailing scenes. 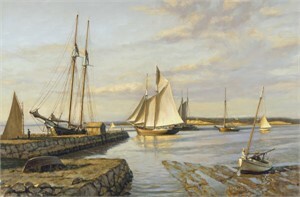 His historical maritime art is painted in a traditional style showing the beautiful details of the yachts and their rigging. 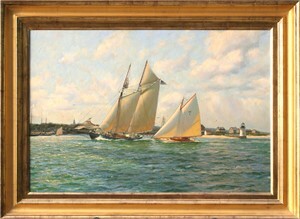 The paintings are often historic yachting harbour scenes, including Newport, Nantucket, New York, Martha's Vineyard, Marblehead, Boston, Cowes, Isle of Wight, Auckland and Venice; or blue-water ocean races. Most of the historical America's Cup races have been captured including the first race around the Isle of Wight won by the yacht "America." A D Blake's marine paintings are beautiful paintings of beautiful scenes. 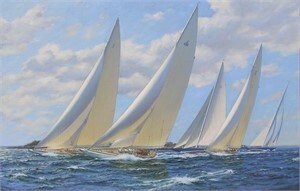 He captures the sheer beauty of the historical yachts with their canvas sails. Canvas has lovely warm colours, particularly when the light shines through it. The details of the yachts are important. The subjects, the yachts and their rigging, are so beautiful that they need accuracy and fine details to portray this loveliness. All his marine paintings are oils on canvas. His painting style is traditional, using the time honoured approach of building the painting up in a series of layers from thin transparent layers through to thicker layers of impasto paint and finally the application of some brilliant glazes. Blake continually experiments with his technique to gain the greatest visual effect for each particular painting. It is vital to him that his art is dynamic and creates an impression of life and movement. He concentrates on the interplay of light, especially on the water and on the boats and sails, and demonstrates a use of a multiplicity of colours in the shadows and also in the reflections of the sky and the boats in the sea. AD Blake's thorough knowledge, understanding and long personal experience in racing and designing yachts of many varieties is evident in his paintings and lends an authenticity to them. A highly actively involved sailor he has an inate sense for the set of the sails and the angles of the hulls in the water. The historical aspect of each painting is important and portrays Blake's fascination with the history of yachting. Historic details are gained through thorough research utilizing books, libraries, historical societies and yacht clubs. 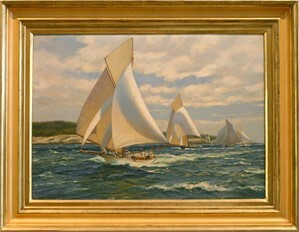 Many well known yacht designers' vessels are featured in AD Blake's paintings, including Nathaneil Herreshoff, Edward Burgess, Olin Stevens, William Fife and Robert Logan. Much of Anthony Blake's inspiration comes from visiting locations of likely subjects and completing small oil 'sketch' paintings to capture the local colour and 'artistic feel' for the location. He travels widely with regular trips to the United States and Europe. A D Blake was born and lives on the coast of New Zealand. He has always been intensely interested and involved with yachting and fascinated with yachting design and construction. He first commanded a yacht at age six, the New Zealand "P" Class dinghy and has been racing a variety of yachts competitively since then. Anthony Blake graduated with a Master of Engineering (First Class Honours) and discovered his artistic passion and talent once his university studies were completed. 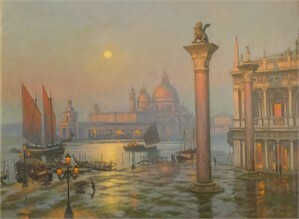 He is artistically self taught; partly by closely studying the techniques and paintings of those Old Masters and Impressionist artists that he admires. His family has deep roots in maritime history with sailing ship captains in both his and his wife's families. He was fascinated by the stories of his wife's grandfather of his voyages around the world as captain of a sailing ship. His brother, the late Sir Peter Blake, was one of the world's revered sailors. Tony presently races the 59ft gaff- rigged cutter, "Thelma" designed and built in New Zealand in 1897 and restored to perfection in 2006. He has just stepped down as chairman of the New Zealand Classic Yacht Association and is passionate about preserving these beautiful historic boats. 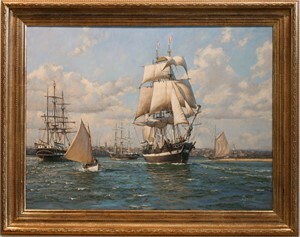 His paintings have been published in many books and magazines and reside in corporate and private collections worldwide including the New York Yacht Club, the Royal New Zealand Yacht Squadron and the Herreshoff Marine Museum.